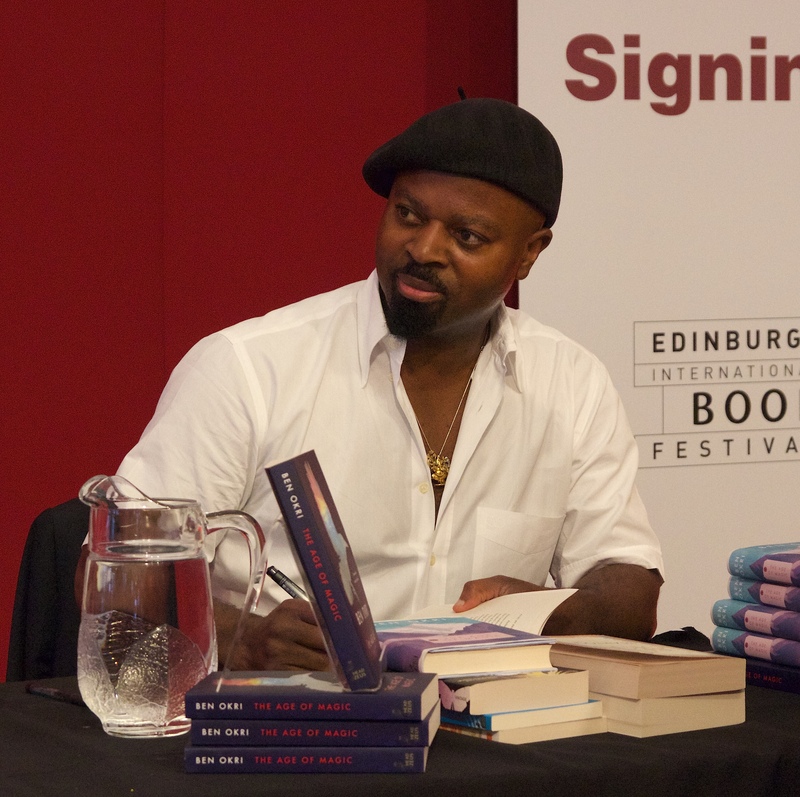 The chair, Rosemary Burnett, introduced Ben Okri and his latest book with a description of his new and unique style. A journalist had called it fictive philosophy but Okri prefers the term Stoku. A fascination with the smallest possible unit of words that could form a story or poem led him to spend years working on blending haiku and short stories. Drawing on the rules of haiku his new form must follow four rules to be called a Stoku. It must be dreamlike, it must have a single unifying theme, it must say something about the weather or atmosphere, and it must have a brush or lightning flash of revelation. He explains all of this with the same soft intensity that comes through in his work. 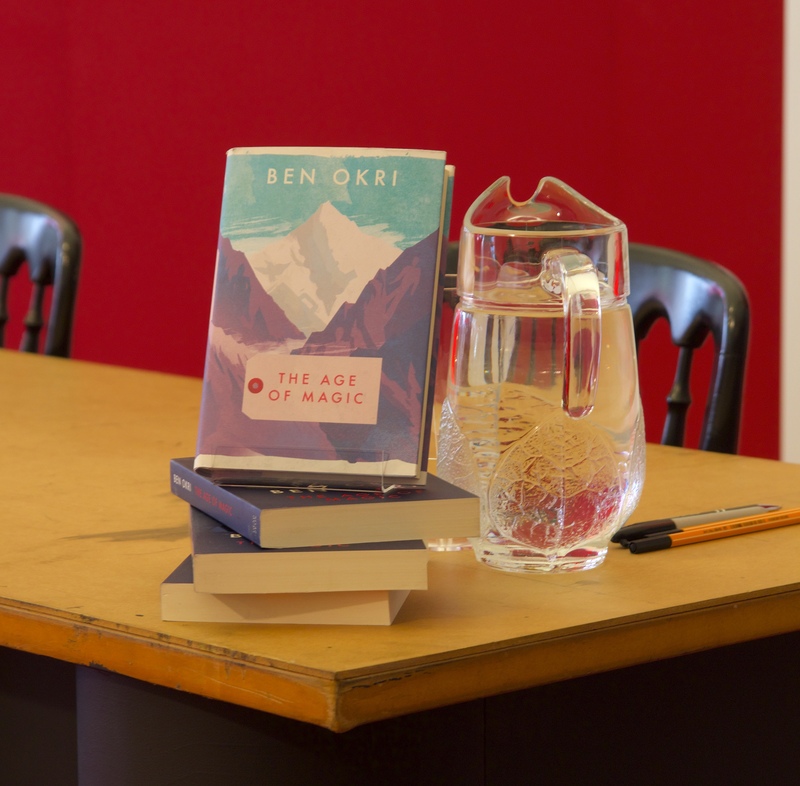 When asked to talk about winning the Man Booker prize he offers instead to read a poem, looking over his glasses to ask the audience what we were in the mood for. In the end, he read two. One that rhymes and one that doesn’t, so that we don’t make the mistake of thinking he only writes rhyming poetry. The second poem, he tells us, is an abstract poem, though he’s not quite sure what the term ‘abstract poem’ means. As he reads he glances up often and accompanies each line with a gentle hand motion, sometimes echoing the metaphors in the line he’s reading. He talks of getting his literary education from his mother’s stories, the world around him, and his father’s library of English classics. As a boy Okri was always told to dust the books and sometimes he would find cobwebs between the pages, leading him to wonder if their house was occupied by rather literate spiders. His mother’s stories were never direct, always tangential and this started Okri thinking about the way we see things. He feels we look more with glances and things that are barely seen than we do by staring directly. The tangential makes us philosophise and he is fascinated by the things that exist only in our peripheral vision. Another fascination is the idea of the journey, the fact that you can take a trip to Paris and come back the same but on another day you might walk to the local bar and have your entire life change. A journey can happen in a conversation because it’s not a physical movement but a shift in consciousness. Okri describes how the smallest things can precipitate a change and that the big events are less influential than they might seem. Something can be unremarkable when you first see it but be filled with meaning when you remember it years down the line. He picks up his new book to read the first chapter. Originally three pages the chapter has become one sentence. He has us say it out loud, slowly. He wants us to listen not just to the words, but also to the spaces in between. He thinks people read to fast and that reading slowly can change the nature of the text. This view comes through in the way he speaks as though each syllable has value. He states that reading should be an act of consciousness as it is the quality of attention that is the precursor to all change. The world could be filled with Shakespeares and Homers but if no one is paying attention to the words they read then these great works are simply sitting and waiting. When asked about the craft of writing he talks of inspiration being a flower. It’s a gift and it’s beautiful but you still have to grow the plant to earn the reward of that flower. Writing requires daily practice. You have to earn the moments where an idea simply arrives without prompting by working at it; otherwise you become a prisoner of inspiration. When it leaves, you have nothing. He speaks of being filled with stories and novels just waiting for the day he can begin them but even once inspiration has flowed he writes with great care and consciousness, so that each sentence is given full consideration.